The Mountain Brook Art Association will hold its 34th annual Spring Art Festival April 18 in Crestline Village. The art show will feature original artwork for sale by local artists. 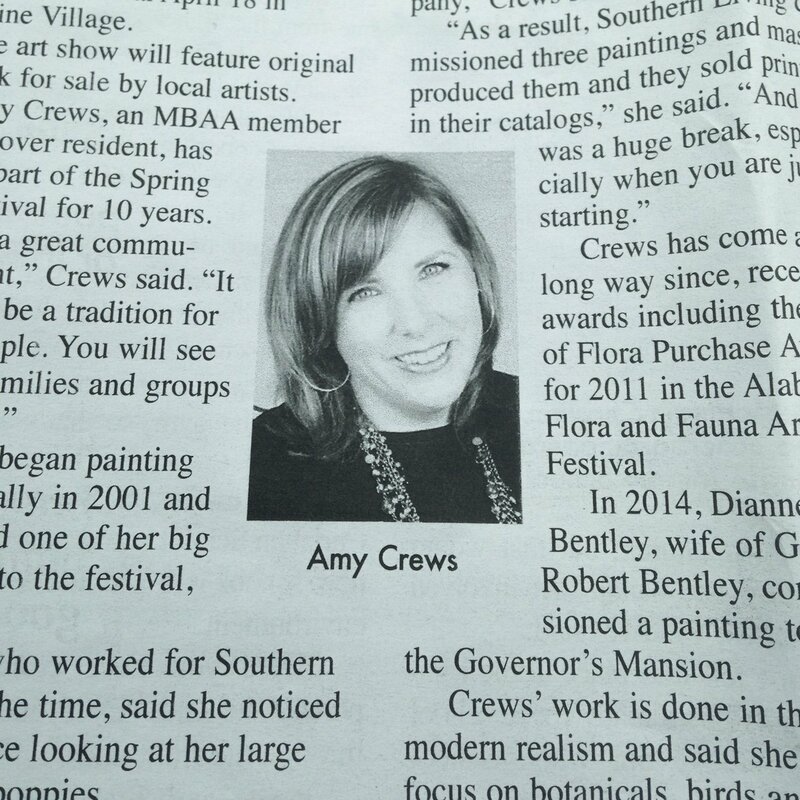 Amy Crews, an MBAA member and Hoover resident, has been a part of the Spring Art Festival for 10 years. Crews began painting professionally in 2001 and experienced one of her big breaks due to the festival, she said. Crews, who worked for Southern Progress at the time, said she noticed a familiar face looking at her large paintings of poppies. The woman, Crews said, was interested in using the paintings in a photo shoot for a magazine and wanted to borrow them and show them at a meeting. As it turns out, Crews discovered that the woman worked for Southern Living at Home, but Crews kept her own employment with the company under wraps. “I wanted them to use my paintings because they were good, not because I worked for the same company,” Crews said. Crews has come a long way since, receiving awards including the Best of Flora Purchase Award for 2011 in the Alabama Flora and Fauna Arts Festival. In 2014, Dianne Bentley, wife of Gov. Robert Bentley, commissioned a painting to hang in the Governor’s Mansion. Crews’ work is done in the style of modern realism and said she tends to focus on botanicals, birds and a few animals. Crews said her most popular paintings tend to be her nest paintings, which feature a nest holding detailed eggs. Crews said her advice to festival patrons is that once they have found a painting to purchase, they should ask what the painting meant to the artist as he or she created it. “When you know the artist and you know the story, it adds value, I think,” she said. Crews and other artists will display works of art for sale at the festival from 9 a.m.-4 p.m. on the sports field on 25 Vine Street. The Birmingham Belles will attend the event. Choko Aiken Band will perform jazz music. The rain makeup day is April 19 from noon-5 p.m.
For more information, visit www.mountainbrookartassociation.com.